Bathroom window safety glass is required if the bottom edge of the window is within 60” from the tub or shower standing surface. This bathroom window safety glass requirement has been with us since 1991 edition of the Uniform Building Code. However, almost every single home inspection I perform in a new construction or gut-rehabbed properties fails on the bathroom window… obviously; it’s not an important requirement. 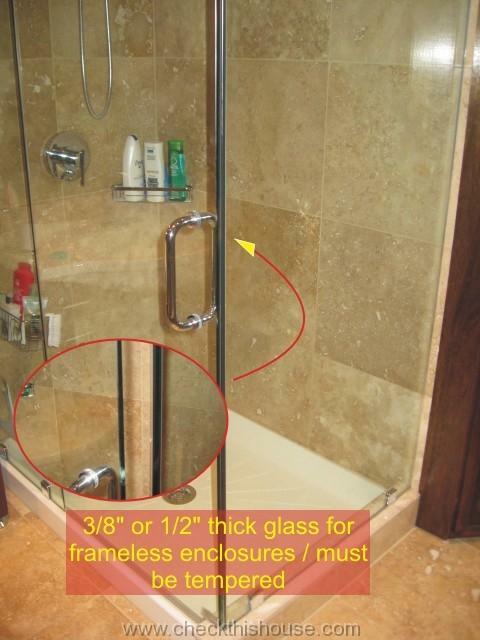 Anyway, for your own safety (not the developers), if you have a window on one of the shower or bathtub surrounding walls and its bottom section of the glass starts less than 60” from the standing surface, look at the corners of the glass. 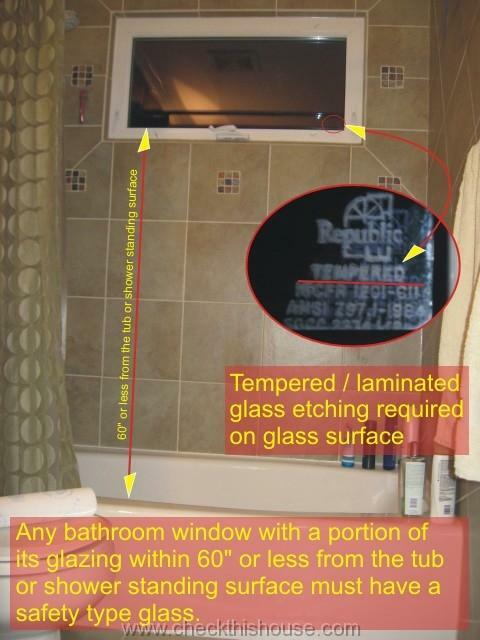 There should be a permanently etched label confirming that your bathroom window safety glass / tempered glass is installed. On occasions, in custom windows, there might be a removable label applied. If there’s no label or visible etching on your bathroom window glass surface, assume that it is not a safety / tempered type of glass and slipping or falling onto such window may result in serious injury. Laminated glass – it’s a sandwiched sheet of plastic foil between the glass panes. If broken, plastic holds pieces of glass together and prevents injury. Tempered glass – it’s heat treated during the manufacturing process. If broken, crumbles into small pieces, just like the car door glass sections. Wire reinforced glass is no longer permitted for use as a bathroom window safety glass. Other areas in the bathroom that require use of tempered glass are enclosures (including walls and doors) surrounding tubs / hot tubs, showers, spas, whirlpools, saunas, and steam rooms. The same standard as for windows is required. Custom, decorative pieces of glass manufactured for some of those applications might not have any markings / labels that would clearly state type of the installed glass. If you know the manufacturer – ask for the safety glass certificate. Glass blocks (windows or walls) installed in the bathrooms are considered masonry not glass. If you just purchased a brand new property, and there’s no etching on the glass surface, request a certificate from the developer / window company, check with your local building department. Don’t just assume that the bathroom window safety glass has been installed. We are installing a new dormer/bath at our cottage in Leelanau county, MI. Local code folks have been pressed on this issue, because the MI code, reads, “…facing wondows…”. They said yesterday (kind of referring to your comment of an often ignored rule) that they would approve our window placement (barely w/in the 60″ rule) if we could just provide any building (BOCA, etc) practice language to “…protect their butts”. Can you provide any assistance here… please? Our contractor missed this rule and we have special order windows now on site… w/o tempered glass, and cost asisde, it will take Anderson 4-5 wks to deliver the tempered sashes..
HELP! And, in advance, many thanks. As I read what you’ve offered, along with other language, this regulation seems to be referring to glass w/in 60” vertically from the tub standing surface, or shower drain… hence the “…bottom of the exposed window” statement. Other references even show a diagram showcasing a vertical distance, or referring to windows above the tub/shower. Our issue involved windows on the opposite wall of the bathroom from the shower, and horizontally measured, barely w/in the 60” requirement. Our bath layout: The shower is located in the inside corner or the new 7.5’ x 8’ room. The window in question is centered on the opposite, outside wall. By my calculations, the center of the shower door is 60” from the bottom center of this window. The closest corner of the window is 58” from the center of the shower door. Does this window need to tempered glass? Again, many thanks for the response. I’m not sure what exactly they need and what you’re trying to say. Do they need a paragraph from the code book stating that a window is permitted within 60″ from the standing surface of the shower or tub? I’ve never seen such statement. The only statement applying to a bathroom area is that it’s considered “hazardous location” and any glass sections (except for a glass block which is considered masonry / not glazing) within 60″ from the standing surface of the shower or tub must be safety glass type. saunas, steam rooms, bathtubs and showers. inches (1524 mm) above the walking surface. You’re correct, it does refer to a vertical distance to the glass on walls enclosing the tub, shower base, hot tub, etc., and from the base surface level. Since the window is not located on any of the walls “enclosing” the shower base, that rule should not apply to it / you wouldn’t need a safety glass window. There’s also nothing that refers to the center of the shower door and window(s) on the opposite side of the shower enclosure / not installed within it. However, item #6 from the code might apply to your window if you have a bathroom entrance door within 24” from the glazing and the glazing is less than 60” from the floor walking surface (both distances must be present to apply this rule).